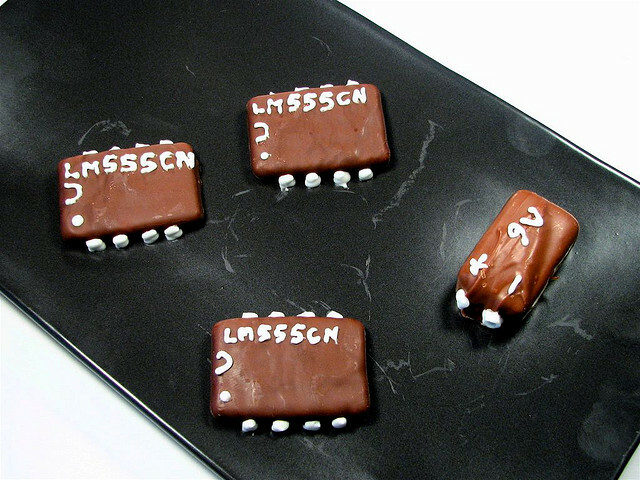 The 555 chip, imagined as delicious chocolate-covered graham crackers. And it was indeed a tasty chip, a major landmark in electronics. Photo (CC-BY) Windell H. Oskay. Hans R. Camenzind, the Swiss-born engineer who worked in the United States, is responsible for major advancements in electronics and circuit design, but perhaps none so great as the 555 chip. This single integrated circuit is one of the most ubiquitous ever created, but even more importantly, has been for many a curious youngster, electronics hobbyist, or musician a window into the world of electronics. It can be a key to a world where you make your own electronic creations, rather than just relying on some distant manufacturer to produce them for you in a sealed case. And, oh yes, it can make a circuit that produces some significant amounts of noise – or, if you like, music. Extraordinarily, the 555 was laid out entirely by hand, a remnant of an earlier time. But you can have at using it yourself in a simple circuit. Even if you’ve never picked up a soldering iron in your life, the Atari Punk Console circuit can be a terrific introduction to DIY electronics. Thank another brilliant mind, Forrest M. Mims III. It uses the 556 variant, which actually combines two 555s on a single chip. My friend Collin Cunningham did a nice video walking you through the circuit for MAKE. Mr. Camenzind, we salute you. And in a world where anti-immigrant rhetoric is popular among politicians, consider this: Camenzind has 20 patents to his name, all working in the United States. A recent study, in fact, showed that “immigrants played a role in more than three out of four patents at the [United States’] top research universities,” most often in areas like science, tech, engineering, and math. It’s simple: immigration policies that force out foreigners force out innovation with them. I’m humbled myself, like nearly all Americans the product of immigration, to find myself in another country, and even more so by the opportunity to be part of a global community of people spreading ideas in technology worldwide. Let’s keep making noise – even the ones that scare cats and small children.